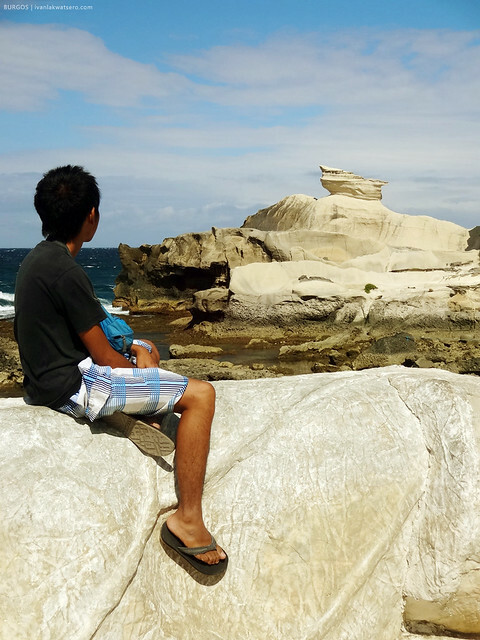 After our Pagudpud trippings, we headed south for some more adventures. A day with a waterfall, a rock formation, an old lighthouse and some wind turbines... and of course with her. hehe. Day 2 of our 4-day Ilocos tipid trip coming right up. 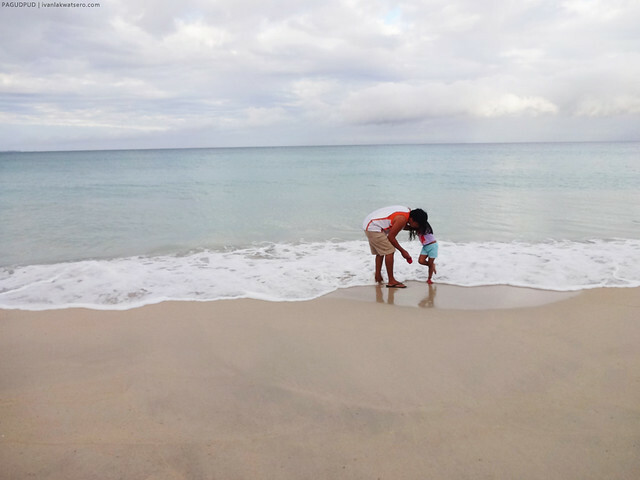 For the first part of our trip, kindly check out this link: Pagudpud All Day. 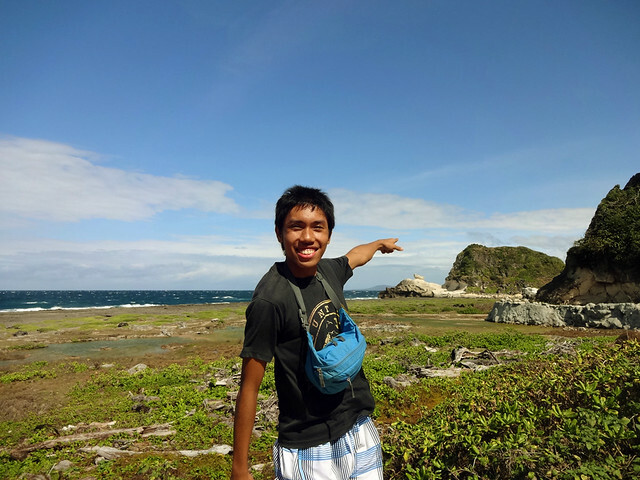 We began day 2 of our Ilocos Trip with a morning hayahay walk at Saud beach. 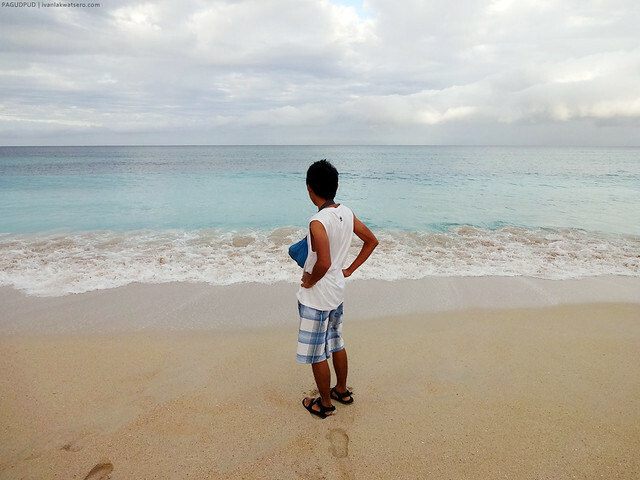 It was our last chance to savor the white sand beach of Pagudpud since we're scheduled to leave the place that morning. Buti na lang, ok na ok ang weather nung umagang yun. calm ans serene. it's easy to fall in love with this kind of beach. Following the shoreline, we walked northward towards a bunch of what seemed like fisher folks checking the day's catch. 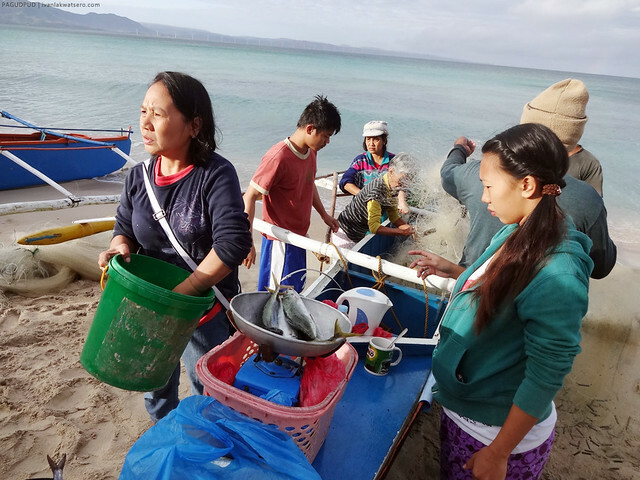 For people like us who lived most of our days in the urban jungle of Metro Manila and do not really see fishermen's actual way of living, it was such a sweet interesting scene. 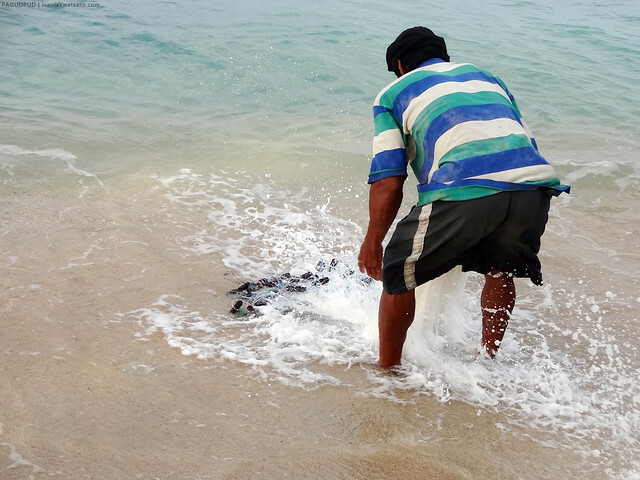 I wonder how many kilograms of fish do these people catch each day. 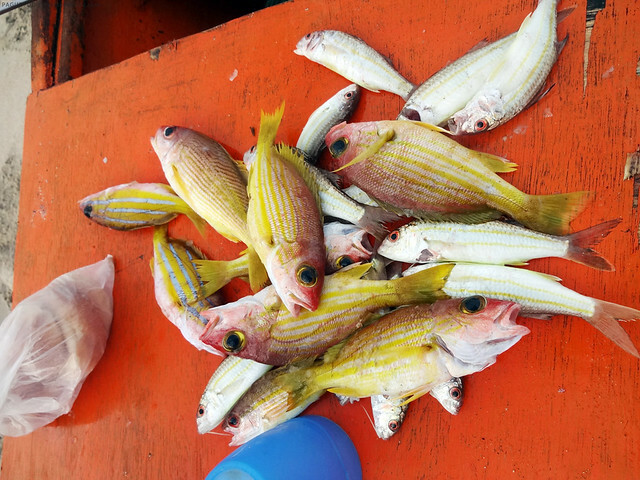 Look at today's catch, a bunch of yellow with blue stripes fish. Ano kaya lasa neto? Others are still not done fishing that morning. 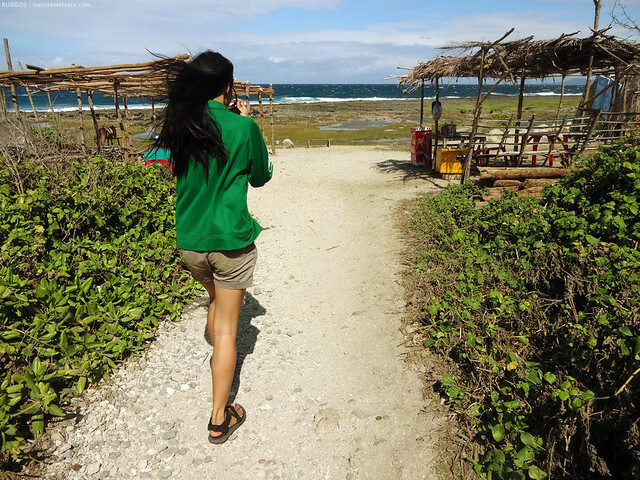 After the leisurely walk by the beach, we headed back to our room, took our things, ate again the walang kasawaang Ilocano breakfast (Vigan longanisa + sukang Iloco), rode a trike to the plaza, and then finally took a bus bound to Burgos town (bus from Pagudpud to Burgos - P30). 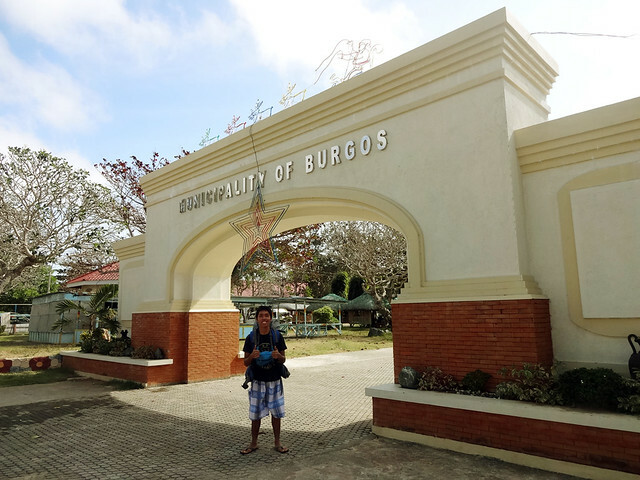 Destination 2 in our Ilocos trip: Burgos Town. 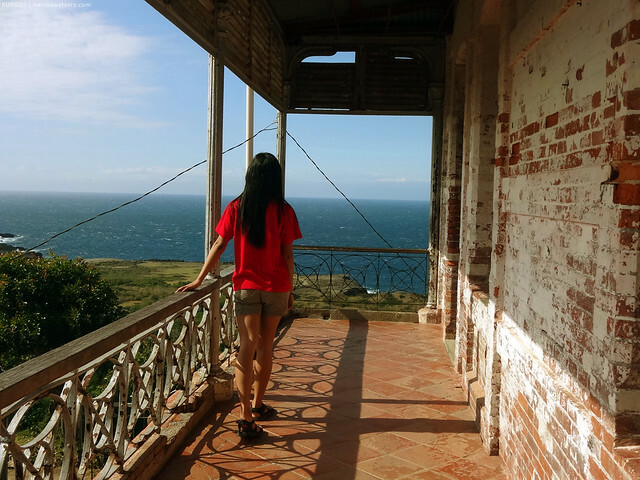 Originally, we only got Kapurpurawan Rock Formation, Cape Bojeador Lighthouse and Bangui Windmills listed down in my list of must-visits in Burgos-Bangui leg of our Ilocos trip. 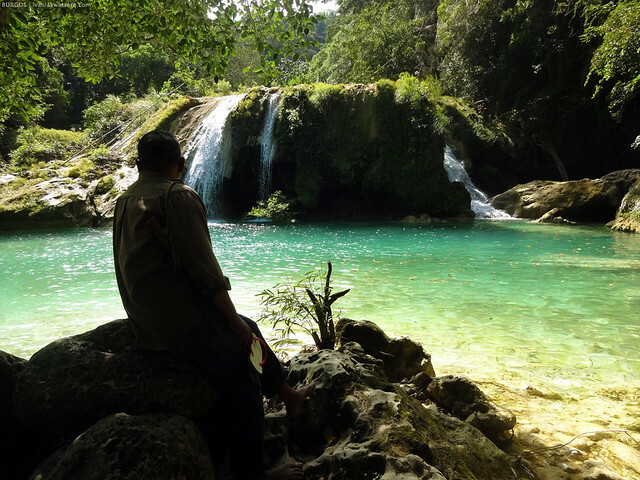 But upon checking with the tourism office of Burgos Town, we discovered that there are other more interesting places to check out, particularly gorgeous waterfalls. Kaya minsan, ok na ok talaga na dumadaan sa mga tourism office, they'll provide the infos that are usually not easily seen online. I drooled when I saw in pictures those waterfalls listed in their tourism brochure. 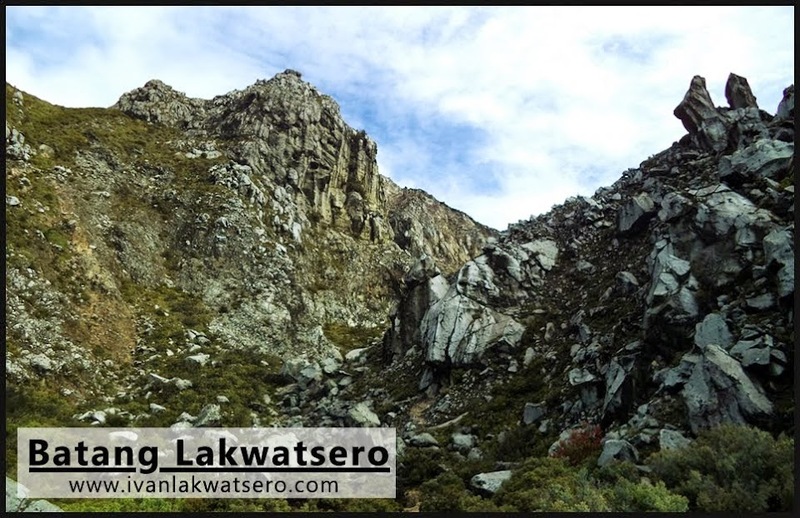 Sa kasamaang palad, we can only fit one (from the 5-6 waterfalls listed) to our hectic itinerary. Nevertheless, that one waterfall was a bomb! Why a bomb, if you ask? Well, better read this separate article about Tanap-Avis Falls. An unpopular, underrated destination somewhere deep in the forests of Burgos is this Tanap-Avis Falls located in Brgy. Tanap. We never heard of it nor seen it in any sources, dun lang sa tourism office. So we can consider our visit plainly a gamble. Tricycle ride plus guide to the falls costs only P300 by the way. 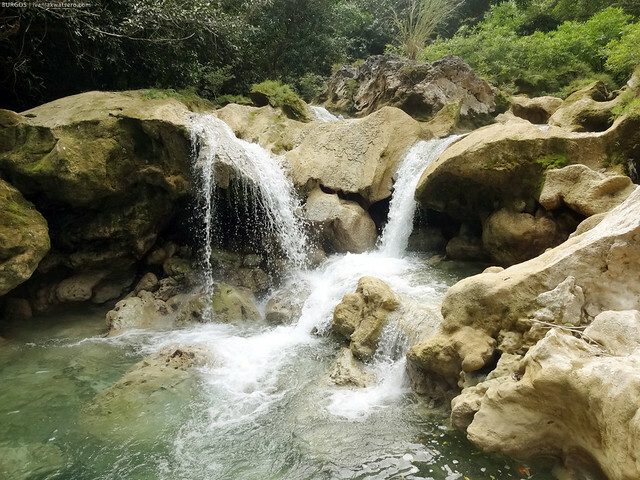 About 30 mins on the road, and another 30 mins of trek led us to a series of dramatic cascades and enchanting pools. The experience was astoundingly beautiful and so remarkable that it deserves a separate post in my blog. Please do check it here: Tanap-Avis Falls. the water is refreshingly cold at napaka linis din. Look at the mother falls. I was speechless when I first saw this. However, we only killed an hour or less in this magnificent place. Gustuhin man namin mag-stay the whole day, we can't. At around 12:30 in the afternoon, we left the place and carried on to our next Ilocos destination. 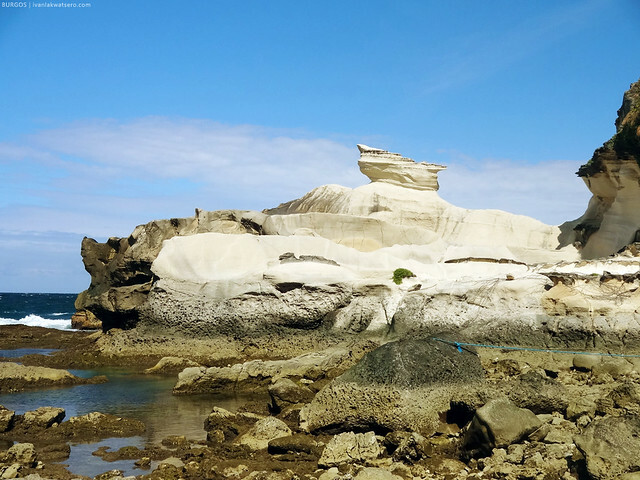 We again hired another tricycle to bring us to two of the most frequented spots in Ilocos Norte—the iconic Kapurpurawan Rock Formation and the old Cape Bojador Lighthouse. Getting to these places weren't a challenge at all. All you need to do is hail a trike from the Toda beside the municipio and arrange for trips to these locations. Rate is fixed at P300. First stop was the rock formation. Mindless of the midday sun, we walked towards the rock visible from afar. There's an easy-to-follow path leading to it so we did not bother getting a guide nor hire a horse service. Yep, you may opt to horseback ride to the rock. The walk is actually easy and not that long too. Pahirap lang talaga yung init ng araw. It would just take roughly 5 mins to get near the natural sculpture. A product of constant weathering, this interesting rock formation has drawn many visitors in the past years. 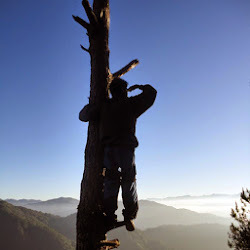 It is one of its kind in the country kaya talagang dinadayo siya. 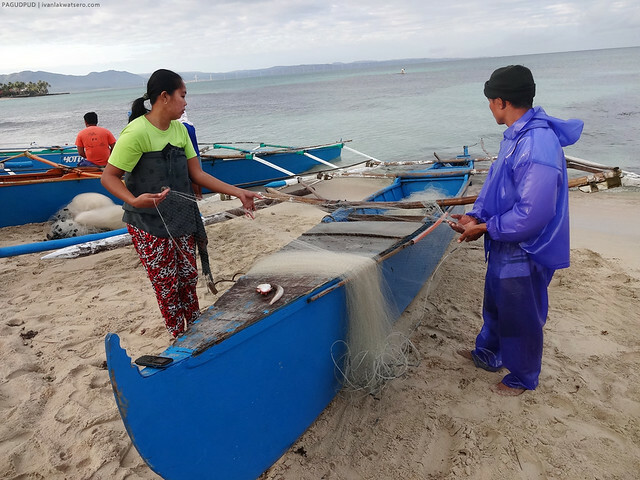 Kung baga e, hindi kumpleto ang Ilocos experience kung wala nito. We would've gone closer but as you can see, there was a blue rope prohibiting anyone from getting near the rock formation. Hanggang tanaw na lang kami, hindi ko man lang nahawakan yung bato. Realizing that it's already past lunchtime, hindi pa kami kumakain at gutom na kami pareho, we decided to carry on to our next stop para matapos na. Not far from Kapurpurawan Rock is our next destination, an old stuff which dates back from the Spanish Colonial era, Cape Bojeador Lighthouse. 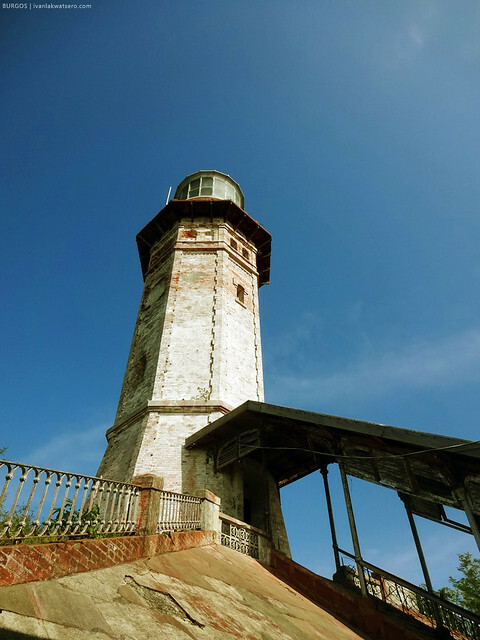 It is among the 20 plus light stations across the archipelago built by the Spaniards in the late 1800's to help in booming maritime trade and sea faring. Only a few survived to this day since many of these lighthouses are either now in ruins or a new modern lighthouse has been built in its place. It is located up a hill, facing the West Philippines Sea. 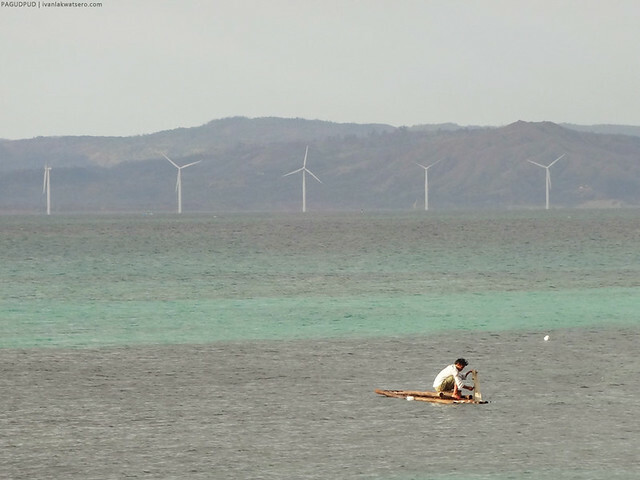 Kitang kita siya if driving along the coastal road. I have also created a separate post about this lighthouse for my Farola Blog Series. Please check out this link: Faro de Cabo Bojeador. 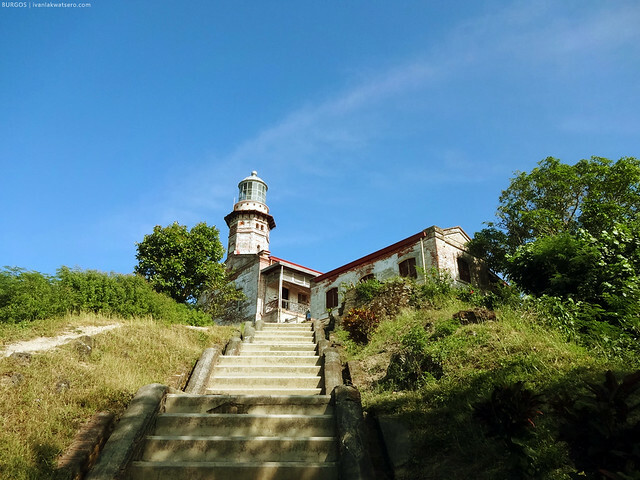 Cape Bojeador lighthouse was partly destroyed overtime due to neglect and natural occurrences (typhoon and earthquake). But as you can see, it stood firmly to survive up to this date. 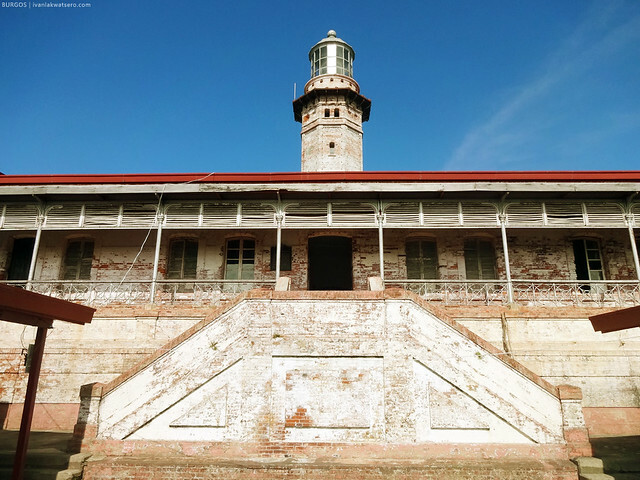 In 2003, the dilapidated structure was restored and opened as a tourist attraction, aside from its maritime function. I've seen several Spanish era lighthouses and I must say, the lighthouse of Burgos is one of the best preserved structures. I always wanted to go up the tower of every lighthouse I visit but it's not possible here since it's locked. We're lucky that there were not too many visitors by the time of our visit. Marami kasi akong nakita at nabasa na puno ng tao dito pag bakasyon. Anyway, we finished the tour as soon as we were able to take good photos of the place. At 2:20 PM, we still haven't had our lunch. 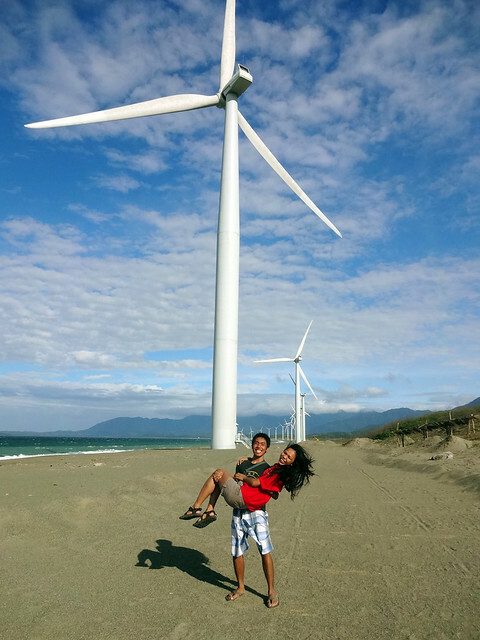 Gutom na ako, but we decided to go to Bangui for our last stop, the Windmills, para lang matapos na. So, from the town plaza of Burgos, we hailed a bus back to Bangui, then got off on a street that leads to the windmills. There's a toda (paradahan ng tricycle) nearby that awaits for tourists like us. They offer two-way trip for P200. 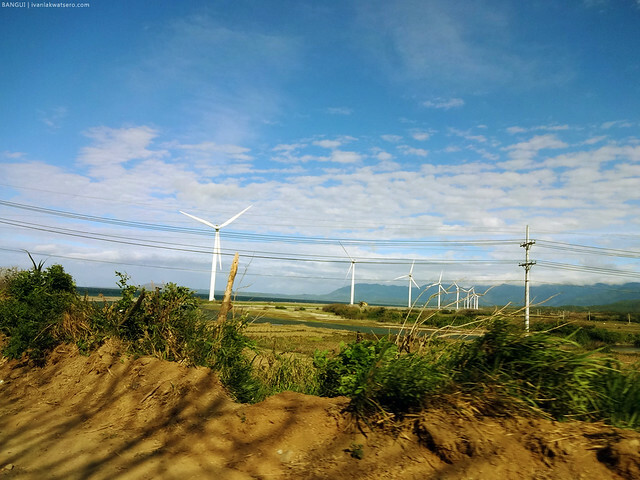 the windmills of Bangui. My second time to see those fans, yet still, na-amaze pa din ako. 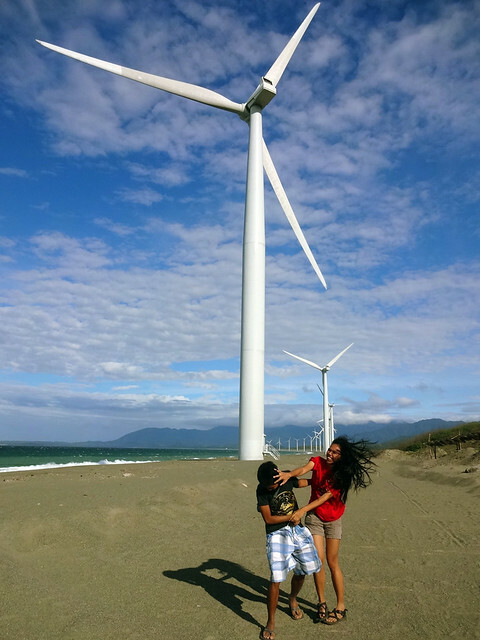 Since windmills aren't a usual scene in the Philippines, many visitors really go here just to see those big fans. The mere sight of the giant turbines makes people happy. There is satisfaction to it, really. Even myself feels so gratified everytime I go to this place. They wouldn't erect these here if it is not windy. Mahangin sa lugar at maaaring matangay ang mga payatot tulad namin. There are 20 giant fans in this beach strip, and each contributes 1.65 MW of energy. 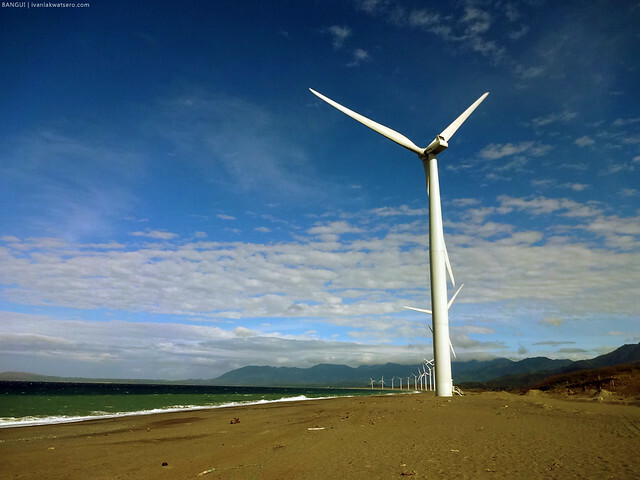 But as you read this article, there are now more units of turbines standing along the coastline of nearby towns of Burgos and and even Pagudpud. 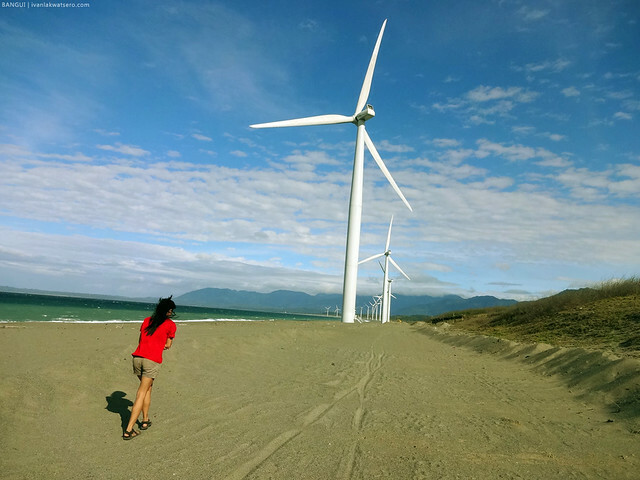 Yup, hindi na sa Bangui lang merong wind farm sa Ilocos Norte. Once at the beach, you'll either pose here for photo ops, or go there for more photo ops. That's true! I think there's nothing else to do here but pose for photo ops, photo ops and some more photo ops. I think we only spent 10 mins at the beach. Aside from the fact that it was really hot there, hindi pa rin kami nakakapag-lunch! At gustom na kami nang sobra! So we asked our tricycle to bring us to the nearby Kangkang Windmill Cafe. The food is ok, and quite typical, but medyo pricey, pero dahil gustom na talaga kami, we didn't mind those things. After the super late lunch na malapit nang maging super early dinner, we headed back to the highway to catch a bus bound for Laoag (bus ride Bangui to Laoag costs P50/head). 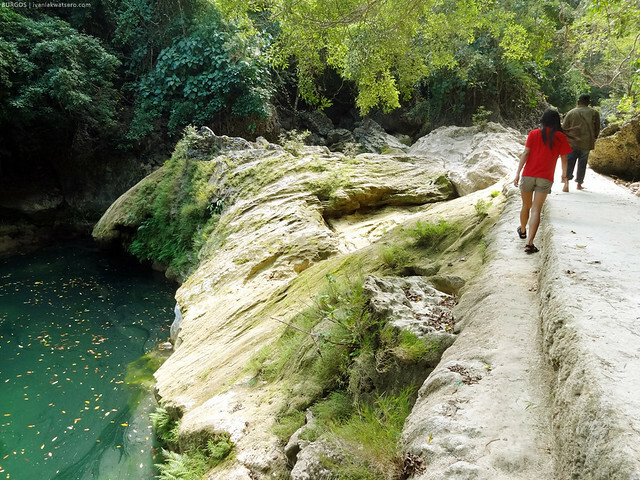 Have you been to Kabigan Falls and Kaangiran Falls in Ilocos? From among, including Tanap Avis Falls, which do you prefer or suggest to go to? Thanks. I've been to Kabigan, but not Kaangrian so I can't really tell. But between tanap and kabigad, of course I'd go for Tanap.